Europe’s Ariane 5 rocket thundered into the twilight skies over the Guiana Space Center on Thursday, embarking on a heavy-lift mission to haul a pair of communications satellites into orbit for Brazil and South Korea. Resuming launches from French Guiana after a month-long stand-still due to a general strike, Ariane 5 checked off its 78th successful flight in a row when dispatching its two passengers into a highly elliptical orbit. The 55-meter tall rocket leapt off its ELA-3 launch site on the edge of the Amazon at 21:50 UTC, 6:50 p.m. local time, powered by its large core stage and twin Solid Rocket Boosters that delivered the kick needed to send over ten metric tons of payload upmass into a high-energy orbit. 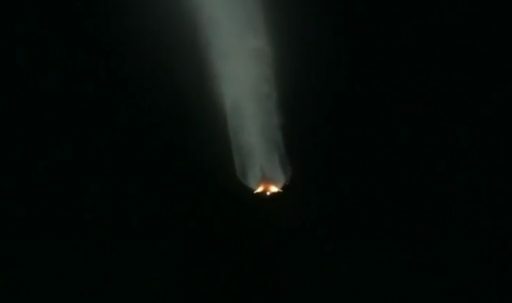 The two EAP boosters fell away from the rocket a little after two minutes into the flight and the first stage handed powered flight to the cryogenic second stage nine minutes into the mission for another 16 minutes of powered flight to reach the desired orbit. 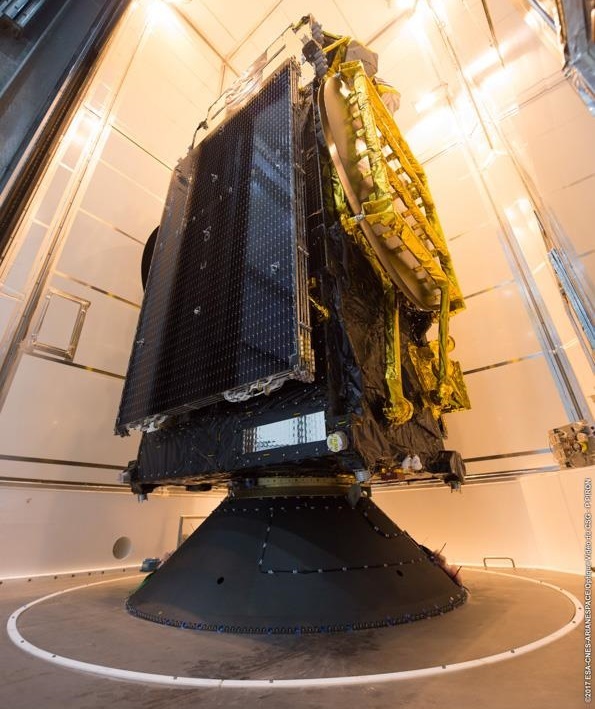 Brazil’s SGDC satellite was first to depart the vehicle to begin a twofold mission of delivering nationwide Internet connectivity and providing encrypted communications for the government. Koreasat-7, riding in the lower payload berth, departed the rocket 37 minutes after launch to head off on a mission to deliver a variety of communications services as part of KT Sat’s fleet. 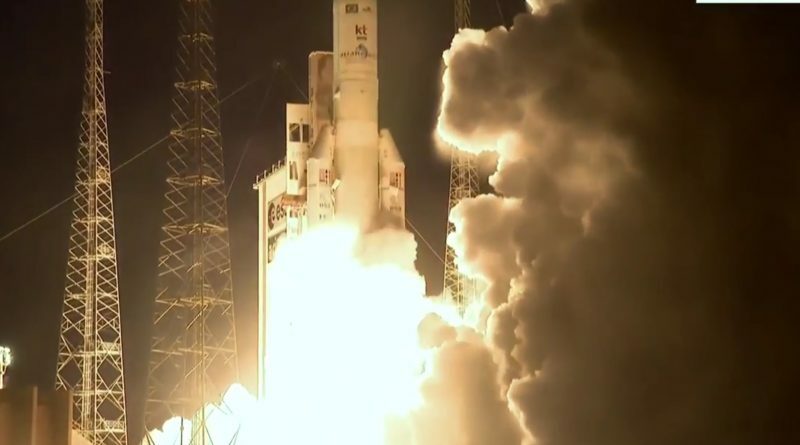 Thursday’s launch came over six weeks later than the original launch date for the VA236 mission, but through no fault of Ariane 5 or its operators as the Guiana Space Center and much of French Guiana came to a complete halt when nationwide protests escalated into a month-long general strike. Ariane 5 stood ready for rollout to its launch pad on March 20 when a strike within the company responsible for heavy transport at the space base delayed the planned move to the ELA-3 launch site. Initially, the labor dispute was expected to be solved in a matter of days but a protest wave across the small French department brought all operations to a stop for over a month. Protesters cited concerns of high crime rates, poor educational opportunities and health care in the rural regions of French Guiana, aging infrastructure and the immediate privatization of a hospital. Barricades were set up around large cities and the main access road to the space center was blocked as the delay to Ariane 5 was seen as one of the more prominent bargaining chips by the protest movement. The dispute was settled on April 21 through an immediate allocation of €1.1 billion from the French government to improve the situation in French Guiana with additional funding packages placed under priority review. 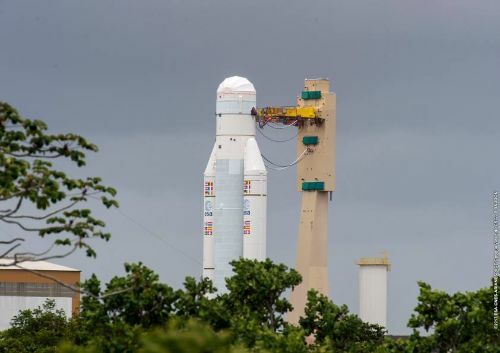 With road blockades being lifted, operations could resume at the Guiana Space Center and Arianespace expects to catch up with the company’s schedule by the end of June, flying three affected missions in what previously was a planned gap of missions in May/June. 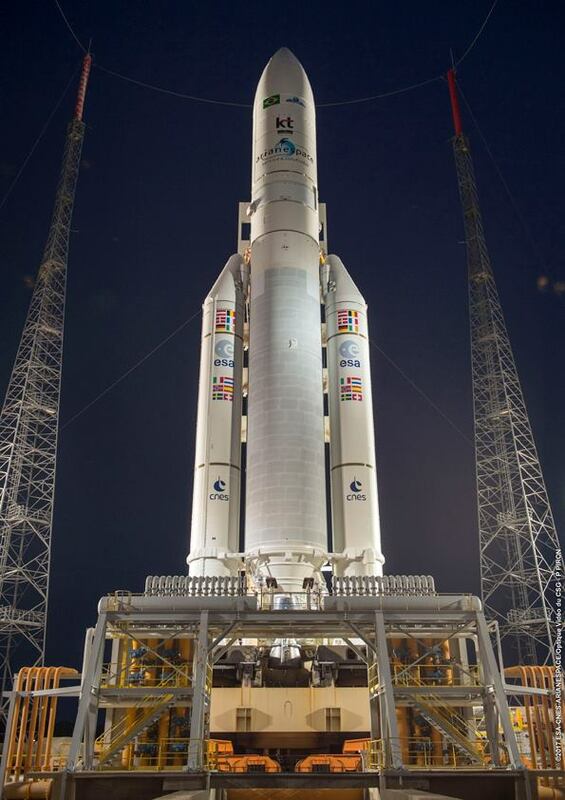 The two satellites launched on Thursday endured the delay atop the Ariane 5 rocket – hidden inside the Final Assembly Building and under protection by a detachment of the French Foreign Legion. In the upper payload slot for this flight was the SGDC satellite, weighing in at 5,735 Kilograms, while the smaller Koreasat-7 spacecraft with a mass of 3,680kg took the lower slot underneath the Sylda adapter. All in all, VA236 required a payload performance of 10,282 Kilograms from the Ariane 5 launcher. Both VA236 payloads were built by Thales Alenia Space in Europe based on the company’s Spacebus platform, making this the seventh all-Thales mission performed by Arianespace. 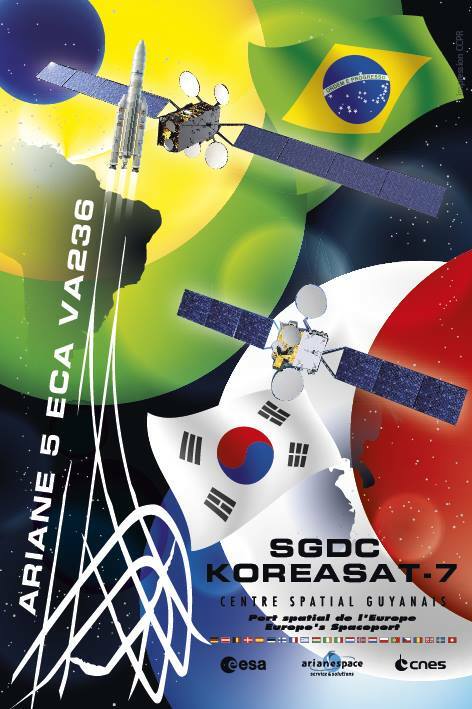 SGDC, the “Geostationary Satellite for Communications and Defense” is operated by Telebras on behalf of the Brazilian government to deliver Internet services across the Brazilian territory using a 50-transponder Ka-Band payload and employing seven X-Band transponders to provide secure government communications in South America and neighboring maritime regions. The total data throughput of the satellite is around 57 Gbps. The objectives for the SGDC project are threefold – in addition to providing Internet connectivity and government communications, SGDC has been set up as a technology transfer program for the advancement of the Brazilian space program. Under the agreement with Thales signed in 2013, thirty Brazilian engineers were trained in all space engineering techniques to transfer relevant knowledge to the Brazilian space program for future projects. SGDC also hosts some structural components manufactured in Brazil. 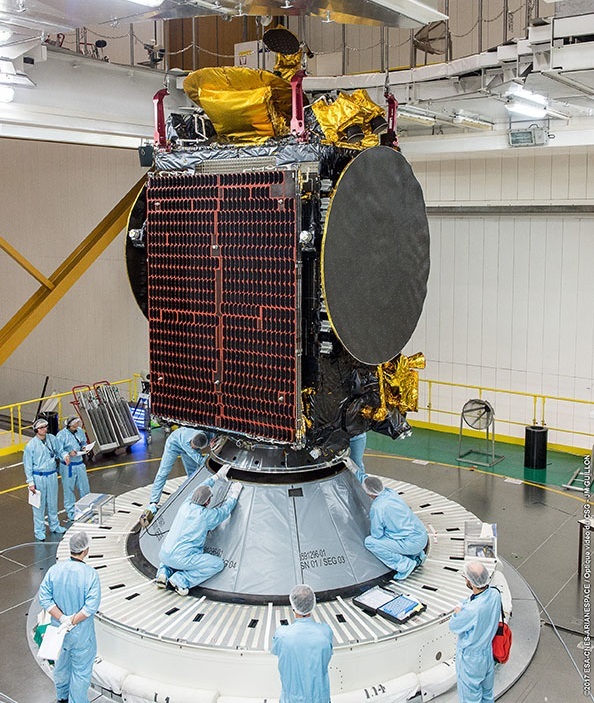 Koreasat-7, operated by KT Sat, will deliver a range of communications services to South Korea including Internet access, multimedia distribution, TV broadcasting and fixed communications. It hosts 30 Ku-Band transponders and three high-bandwidth Ka-Band transponders which feed steerable high-throughput beams that can be used to relocate capacity where it is needed, giving KT Sat flexibility to respond to changing customer demands. Koreasat-7 is the third in the Koreasat series to be launched by Arianespace following in the footsteps of Koreasat-3 launched in 1999 and Koreasat-6 in 2010. After waiting out a lengthy delay, Ariane 5 moved to its ELA-3 launch site on Wednesday and entered countdown operations before dawn on Thursday, eleven hours and 23 minutes before the days nearly three-hour launch window opened. Gearing up for its second mission of the year, Ariane 5 was powered up at L-10.5 hours for detailed pre-launch checks while teams at the pad buttoned up the launch vehicle and ground facility for tanking. 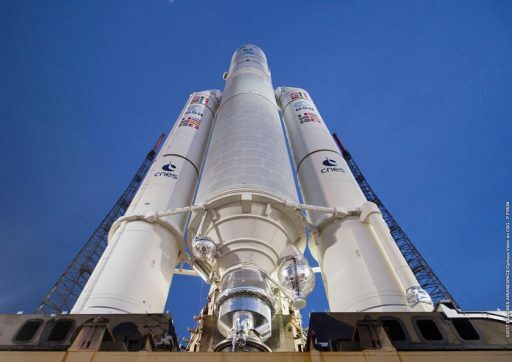 Cryogenic tanking picked up with chilldown operations at the T-5 hour mark before the two stages of Ariane 5 were loaded with 184 metric tons of -183°C Liquid Oxygen and -253°C Liquid Hydrogen propellants over the course of a two-hour sequence. Standing fully fueled, Ariane 5 repeated critical communication checks and received its flight profile for the day’s mission to Geostationary Transfer Orbit. A zone of disturbed weather moved out just in time for the afternoon launch window, however, T-0 had to be pushed into the day’s window due to a delay in the tanking operation. A second hold was caused by a sensor within the ground-based Helium pressurization system that dropped offline and required workaround steps to recover the telemetry data – pushing the launch further into the window and after the local sunset time at 21:37 UTC. The countdown switched into automated mode at the T-7-minute mark to put Ariane 5 through its highly choreographed Synchronized Sequence that encompassed the steps necessary to close out propellant loading, pressurize the rocket’s tanks, transition it to internal power and configure the Flight Control System for blastoff. 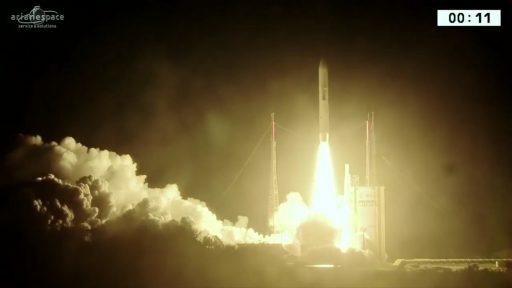 Upon clocks hitting zero, Ariane 5 came to life as the Vulcain 2 main engine fired up to reach a liftoff thrust of nearly 100 metric ton-force under careful supervision of computers that ensured the engine was up and running before the point of no return – ignition of the two EAP boosters at 21:50:07 UTC. Jumping off its launch base with a thrust equivalent to ten Airbus A380s at full power, Ariane 5 quickly gained speed as it balanced in a perfectly vertical posture of the first 13 seconds of flight, soaring toward the dark of night atop pillars of fire and smoke. 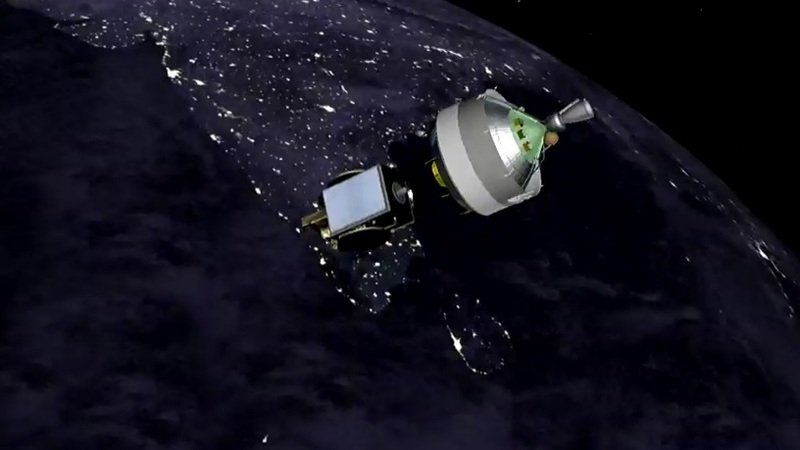 Gimbaling its main engine and twin boosters, Ariane 5 entered a careful pitch and roll maneuver that closed out 32 seconds into the mission with the rocket on a due easterly course toward a low-inclination orbit, set to cross over the Atlantic Ocean in just 20 minutes time. Blazing uphill with a thrust of 1,420 metric ton force, Ariane 5 passed the speed of sound 49 seconds into the mission followed twenty seconds later by the area of maximum dynamic pressure when passing through 13 Kilometers in altitude. Doing most of the heavy-lifting in the initial flight phase, each of the boosters consumed 237 metric tons of propellant in just over two minutes. Burnout of the boosters at T+2 minutes and 21 seconds was sensed by their declining chamber pressures, triggering the pyrotechnic separation of the two EAPs from the still-firing core stage 65 Kilometers in altitude after the twin boosters helped accelerate the vehicle to a speed of two Kilometers per second. With the boosters gone, Ariane 5 relied on its trusted Vulcain 2 engine alone, climbing to a thrust of 136,000 Kilogram-force when flying through the rarefied outer layers of Earth’s atmosphere. As soon as Ariane 5 had departed the dense atmosphere, it split open and separated its 17-meter long fairing halves, shedding no-longer-needed weight three minutes and 22 seconds into the flight. Fairing separation at 115 Kilometers in altitude revealed the SGDC satellite while Koreasat-7 remained hidden under the Sylda. The first stage reached the end of its propellant supply eight minutes and 53 seconds after liftoff when the Vulcain 2 engine was shut down after placing the vehicle onto a sub-orbital arc peaking just over 160 Kilometers in altitude. The 30.5-meter long core stage dropped away four seconds after shutdown, clearing the ESC-A second stage for ignition just after the T+9 minute mark. Firing up on a burn of 15 minutes and 54 seconds, the upper stage’s 6,400-Kilogram-force HM-7B engine found itself tasked with accelerating the vehicle by another three Kilometers per second to accomplish the high-energy injection. 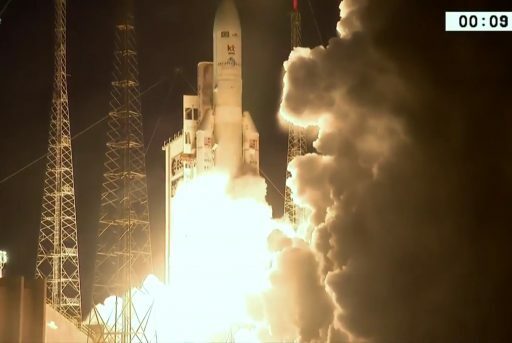 Initially focusing on building speed, Ariane 5 passed its minimum altitude 15 minutes into the flight, from then on headed uphill to drop the satellite off in a highly elliptical orbit. Powered flight concluded after 25 minutes when the second stage sensed it had arrived in the mission’s target orbit of 250 by 35,925 Kilometers at an inclination of 4 degrees. After a smooth climb to orbit, the mission transitioned from rocket-powered acceleration to the equally important ballistic phase that aimed to position the satellites, Sylda and second stage onto slightly different paths to ensure all will enjoy a clean flight without re-contact. SGDC was first to depart the second stage, pushed away by loaded springs 28 minutes after liftoff, embarking on a mission of at least 18 years stationed at 75 degrees West. The Sylda adapter was jettisoned right at the half-hour mark in Thursday’s mission followed by another seven minutes of maneuvering before the KoreaSat-7 satellite was separated to begin its 15-year mission covering South Korea from a position of 116 degrees East. 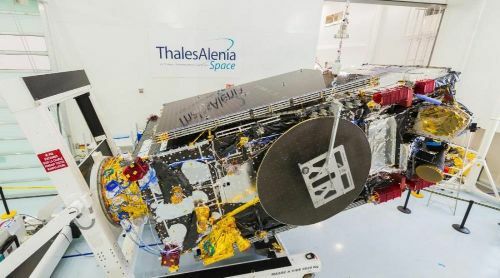 Both satellites were to check in with their respective ground stations after separating from the booster and are currently in operation by their manufacturer Thales Alenia that will guide the spacecraft to their planned locations in GEO and complete testing before turning the satellites over to their operators. 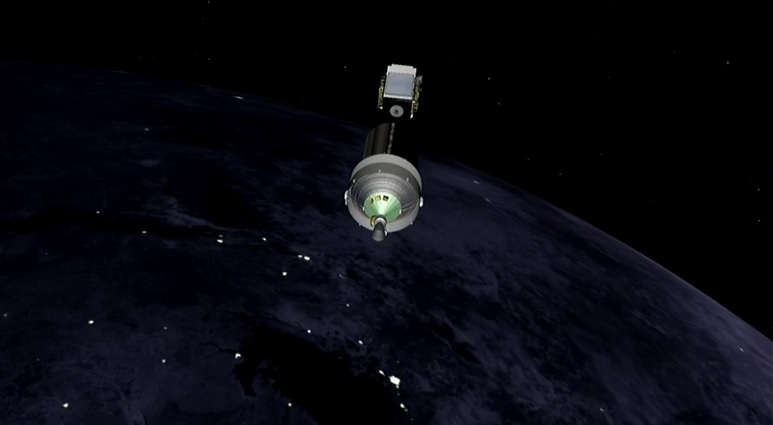 With both satellites safely on their way, Ariane’s second stage headed into a twenty-minute passivation process to close out its mission in orderly fashion. Thursday’s launch marked the 236th launch of an Ariane rocket in a program that premiered in 1979, it was the 92nd flight of the Ariane 5, the 61st using the ECA configuration. 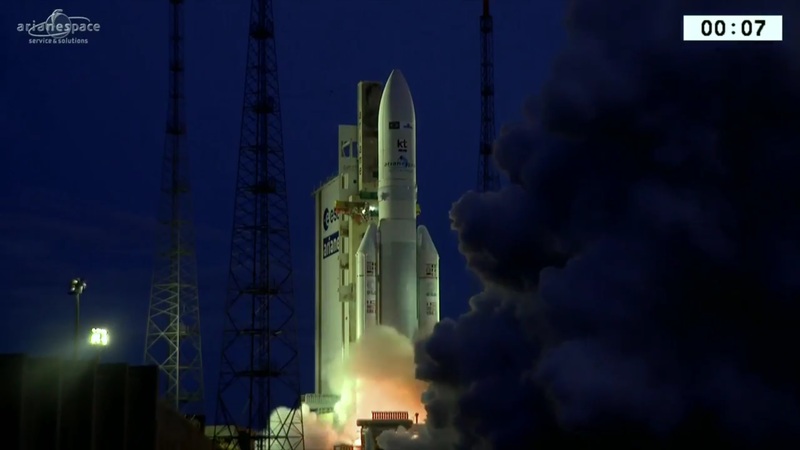 It was the fourth Arianespace mission of 2017 and the second with Ariane 5. Copyright © 2019 Ariane 5 VA236 | Spaceflight101. All rights reserved.